Kevin McManaman is a partner of the Lincoln, Nebraska law firm of Knudsen, Berkheimer, Richardson & Endacott, LLP, where he concentrates his practice on commercial litigation, employment law, and workers’ compensation. He practices in state and federal courts, as well as arbitration. 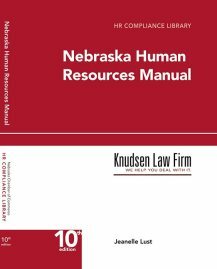 Kevin also writes and updates the Model Policies and Forms for Nebraska Employers and the Nebraska Human Resources Manual.